Jonathan Weiler, co-author of Authoritarianism and Polarization in American Politics appeared in a podcast interview with Salon‘s Glenn Greenwald. 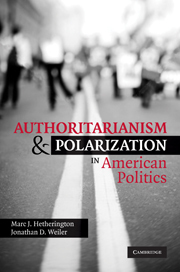 The book — Authoritarianism and Polarization in American Politics — examines newly available empirical evidence to contend that America’s political culture is more stratified than ever before. It makes the case that higher levels of authoritarian behavior — such as all-consuming tribalistic loyalties and rage over group blasphemy (i.e., criticism of the group and its leaders from within or without) — is the primary culprit, particularly (though not exclusively) among right-wing movements. As long-time readers here know, the role played by the authoritarian mindset in political events is a significant interest of mine.